A cellular communicator is a better security choice than landlines of any type (POTS or VoIP). It is more consistently reliable than reporting through the internet or WiFi. This is completely separate from your personal cell phone. It is a device your alarm panel uses-- it replaces your phone line. We don't charge any labor for upgrading to a wireless cellular communicator. Most systems can be upgraded for $99, with a minimal charge added to your monthly for cellular service, $8/mo. 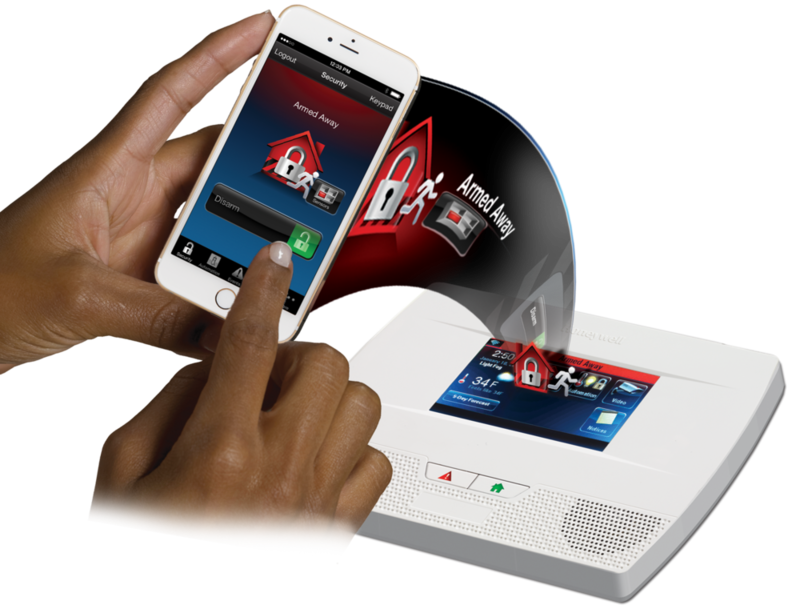 Make your alarm system compatible with iPhone or Android apps, or upgrade to a new alarm system. This can be accomplished 2 ways: you can add a interactive cell communicator to your system OR you can upgrade your panel and keypads and communicator to a Honeywell Total Connect 2.0 compatible system. Ring or Skybell doorbell cameras are available, including installation. Costs: Depends on what you have— let us give you a quote. Our Smartlink+ cameras are viewed through your computer or smartphone. The cameras require a power outlet, but can be connected to the internet wirelessly. Some of these install with no tools required and you can do it yourself! The cloud storage and streaming requires a high-speed Internet connection. You should check your upload speed to see if it is fast enough. The 720p indoor cameras require 1Mbps per camera; the 1080p indoor and outdoor cameras require over 2Mbps per camera. There is a monthly video storage fee associated with these cameras, depending on how many you add.